The Disney empire spreads its wings far and wide. That includes ruling the high seas, as well. 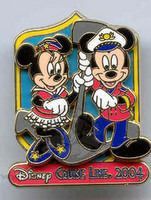 Disney Cruise Line has a couple of boats that set sail on a regular basis from Cape Canaveral, Florida. As you would expect from a company that bears that name, the ships are geared towards good, clean, wholesome family fun. You’ll not only be sharing the ship with a gaggle of families but also with a gaggle of grown ups dressed as rodents, ducks, etc. How fun! Compared to some of its competitors, Disney cruises can be a bit more expensive. But is often the case with the company, you can always find a deal. Often the deal involves a combination of a Disney land and sea vacation. You spend a few days at the Mouse Trap before floating around the sea. This is a popular and fun option for many families. You can also save money from time to time by snatching up a last minute cruise on Disney. This might require some quick planning and shuffling of schedule, but if it means your kids will experience the same magic of Disney as you did as a child it will be well worth it.